Our grain harvester combines separate reaping, threshing and binding operations into a single operation. Having the advantages of high productivity, easy handling and low labor intensity, YTO grain harvester is suitable for use in large area farmlands. As an experienced grain harvester manufacturer in China, we offer three types of wheat combine harvester, including YT2090A1, YT3110 and YT4LZ-2.5. The working widths of these harvesters are 2134/2360mm, 2500/2750/3000mm and 2360mm respectively, so as to suit your various requirements. In addition, their maximum engine power can be 81kw, and the maximum feed rate is 3 kg/s. 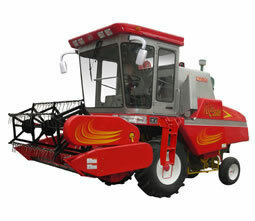 Moreover, our grain harvester is very versatile, which can also be used for harvesting soybeans and barley. If you'd like more detailed information, please refer to our PDF. In order to ensure customers find the product they require, we also provide crawler tractor, forklift truck, and road roller etc., besides combine harvester. Manufactured using advanced equipment and quality materials, our products are reliable and durable. In addition, they are designed and made with environmental protection in mind. As a result, our products are E-mark, CE and EPA certified. Moreover, our company has also received the ISO9000 and ISO14001 certificates. If you are looking for any of our products, please don't hesitate to contact us by email or phone.